Travel is a powerful engine of change. It broadens perspectives and opens the mind to values and ways of living that are at once unfamiliar and illuminating. At the same time the sheer number of people travelling around the world inadvertently contributes to putting our human and natural ecosystems at risk. What can we at VIAGGI SENZA FRETTA do to make a difference? As a travel company in Tuscany, locally owned and operated, we are particularly aware of how important it is to maintain a community’s traditions, culture and environment. Our travel itineraries focus on different ways of reducing your carbon footprint. We’ve personally selected a number of locations and accommodation and offer cultural, enogastronomic & nature itineraries in their immediate vicinity - spend less time travelling and more time seeing! Take a leisurely walk in the countryside - and through the ages. 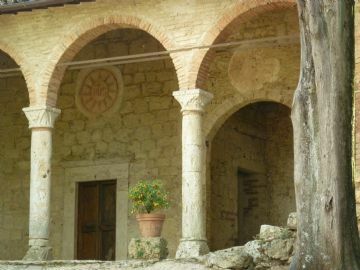 Begin with a visit to one of central Italy's most ancient human settlements, dating back to the Bronze age; stop at a 14th century hermitage with a beautifully frescoed church; visit the charming hamlet Cetona; taste local extra-virgin olive oil and wine; visit a Franciscan convent - all in just one, leisurely walk! 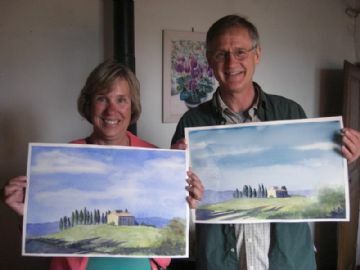 The gentle, rolling Tuscan landscape has always inspired artists from all over the world. So why not have a go at expressing your creativity and creating your very own little marsterpiece to take home with you as a souvenir? Elisabeth, a talented British artist who has been living and working here since 1997 holds fun and informal watercolor courses for beginners that are suitable for everyone - couples, groups of friends and families. She will provide you with everything you need and courses can be held either at her studio or, if you're renting a house, directly at your rented villa. If you're looking for an easy bike trail or footpath in the hills of Tuscany, Il Sentiero della Bonifica, or Path of the Reclaimed Land, is a 62 km bike and pedestrian path which joins Arezzo to Chiusi and is suitable for anyone wishing to travel slowly, including families with children. Ever thought of including a regenerating stop at one of Tuscany's many spa destinations during your travels? The region is full of natural hot springs or 'terme', many of which date from Roman or even Etruscan times and whose waters, originating from deep within the earth's crust, have long been associated with curative properties. Rural activities with children in Tuscany and Umbria - EAT LOCAL! Traveling with children and wondering what you can do to make both your holiday and theirs enjoyable? Consider paying a visit to a "fattoria didattica", a regular working farm on which you can learn about the whole production cylce as well as taste the "real thing" and know you're EATING LOCAL - at zero miles from farm to plate!! Treat yourself, your partner, family and friends to a very special gift while on holiday this year. You're finally on vacation and ready to relax - what could be better than taking the time to learn a few basic strokes to help alleviate neck, shoulder and back tension? New Year's Resolution - Healthy Cooking, Healthy Eating!